Bundle up, sit back, and let the dogs do the work. Oregon Trail of Dreams offers sled dog rides from the base of Mt. Bachelor to Elk Lake Lodge complimented by views of Broken Top and Three Sisters. Sleds hold four people and trips run about an hour long, but an extended, half-day trip is also offered—the marathon 26-mile loop complete with lunch at the lodge. The owners are a father-daughter team and three-time competitors in the Iditarod, the epic 1,200-mile race across Alaska. Central Oregon Avalanche Association offers free, basic avalanche awareness courses once a month through winter. The course includes discussion on the basics of avalanche terrain and instability, safe travel protocol, rescue equipment and procedures, current conditions and product testing. Second Tuesdays each month through the winter season, 6 pm at the Broken Top Bottle Shop, Free. Surrounded by the peaks of South Sister, Broken Top and Mt. Bachelor, Elk Lake Resort in winter is a haven for cross-country skiing, snowshoeing and ice fishing—but you'll have to take a snowcat or snowmobile in. Elk Lake Resort opens Thanksgiving weekend for the winter season beginning with a traditional Thanksgiving dinner and acoustic music at the lodge. Three tiers of ski mountaineering are being offered this winter at Mt. Bachelor's classic uphill race that offers a 4,000- and 2,000-foot climb, and for the recreationalist, the Cone Lap. The event is presented by Outdoor Research, hosted at Mt. Bachelor and supported by the Central Oregon Avalanche Association. Feb. 7 & 8 at Mt. Bachelor-West Village, $35. Oregon WinterFest hosts three days of events including rail jams, music, arts, ice climbing, 5K and 10K runs, and a wine walk. All day, Feb. 13-15, Old Mill District. A cinematic perspective on skiing as a way of life and the introspection it lends skiers, shooting the best of the best in ski terrain including Norway, Peru and Alaska. 7 pm, Nov. 1 at Volcanic Theatre Pub, $15. Chronicling pro riders, this snowmobile film event presents a different show and different films each night. And as the producers say, "You will want to go to both." Nov. 7 at 7 pm, Nov. 8 at 6 pm at the Tower Theatre, $8. Sixty-five years and counting, the film is the latest in this classic ski film tradition, spanning the globe's best ski terrain including Japan, Europe and the U.S. with athletes including Ingrid Backstrom, Seth Morrion, Julian Carr, Tyler Ceccanti and others. 6 & 8:30 pm, Nov. 13-15 at The Old Stone Church, $17. 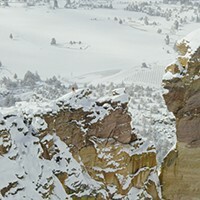 Pine Mountain Sports presents its annual local ski film festival while enticing local winter sports enthusiasts with pow footage, both on film and slides, and in an outdoor gear raffle and schwag giveaway to benefit the Central Oregon Trail Alliance and Deschutes County Search and Rescue. Nov. 19, 6 pm at the Tower Theatre, film entries welcome, $10/club members, $14/door. Meissner Nordic hosts its season opener and celebration, 6-7:30 pm, Dec. 1, Broken Top Bottle Shop. Get your skis waxed. Mt. Bachelor Nordic Center and The Center & Therapeutic Associates is hosting the fourth annual Tour for the Heart. A 5K cross-country ski or snowshoe race is a benefit for the American Heart Association with a focus on women's heart disease education and research. Jan. 25, Mt. Bachelor. Luminaria, an annual Meissner Nordic club fundraiser and tradition skiing by light of luminarias, 5:30-9 pm, Feb.14, Meissner Shelter. Snowboard parallel banked slalom race for all ages, Dec. 12-14, West Village-Mt.Bachelor. Just one flake and we're already thinking skiing!